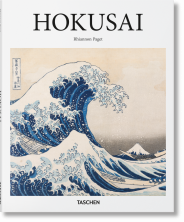 This volume reproduces 139 Japanese woodblock colour prints by 43 famous masters of ukiyo-e, the popular art of the 17th to the 19th century. The originals are in the Riccar Art Museum in Tokyo, the world’s largest and most celebrated collection of such prints. On account of their rarity and value, 87 of them have been designated Japanese National Treasures or Major National Cultural Heritage Items. 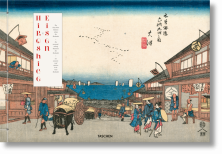 The introductory essay, "Ukiyo-e - Origins and History", by the Curator of the Riccar Art Museum, Mitsunobu Sato, familiarizes the reader with the history of this art form. 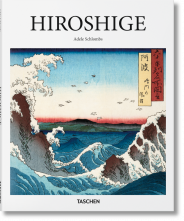 This is followed by the chapter "Cherry - Wood - Blossom", in which Thomas Zacharias, Professor at the Munich Academy of Art examines the technique, content and style of Japanese prints and their influence on European art at the turn of the century. The major section of the book consists of the 139 reproductions, grouped by artist, each accompanied by a detailed, sensitive commentary. Street scenes, lovers’ trysts, festivals, portraits of courtesans and actors, landscapes and travelogues - these are the motifs of the ukiyo-e print. The dominant theme, however, is woman’s beauty, the grace of her posture and attitudes, and the decorative aesthetics of her flowing garments. Amongst the most celebrated of the artists featured here are Utamaro, with his beautiful courtesans and geishas; Sharaku, with his portraits of actors on the kabuki stage; Hokusai, with his landscapes, among them the "36 Views of Mount Fuji"; and Hiroshige, with his "53 Stations on the Tokaido" and his "100 Views of Famous Places in and around Edo". The ten-page appendix includes a glossary of technical terms and biographies of all 43 artists. Gabriele Fahr-Becker studied art history, archaeology, and philosophy, and gained her doctorate from Munich University in 1970 with a thesis on Art Nouveau. She has published numerous books on turn-of-the-century art. 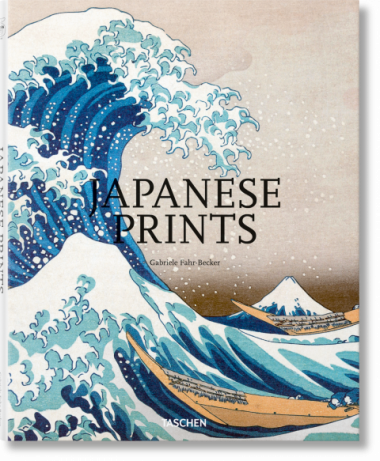 "Collecting together over 130 classical Japanese woodblock prints, this exemplifies the rich heritage of art and design found in Japanese culture... There is an incredible array of subjects to browse, from classical street scenes to portraiture and the author’s incisive text explains both the creative procedures and artistic movements. The book also contains an excellent glossary of technical details and production techniques, as well as revealing biographies of the artists on show."